After a decade as dressmaker to the Her Royal Highness Queen Elizabeth II, Alison Pordum left the royal household to set up her own bespoke couture service in Dorset, Helen Fisher went along to meet her. I cheekily asked Her Majestys former in-house designer and dressmaker, So does the Queen buy her underwear from M&S like the rest of us?, ever hopeful that Alison Pordum might give me a glimpse into the ordinary side our Queens domestic life But, as to be expected, Alisons loyalty to the royal household was as professional and firm as each and every stitch on one of her bespoke gowns. No comment, she replied with a wry smile. I met Alison in her design studio, at her home in the Talbot Woods area of Bournemouth, which she shares with her husband. Alison was dressed casually in a delicately tailored petrol blue blouse and smart blue jeans. It was the sight of her perfect jeans that made me genuinely curious about whether the Queen herself had even owned a pair of jeans? Alison laughed out loud, when I enquired. 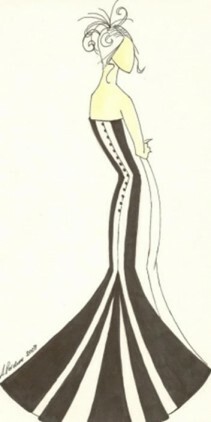 I really dont know, but considering how rarely she ever actually wears trousers, Id be surprised. Alisons own passion for serious fashion came out of the blue. She didnt have any pre-teen obsession with Barbie, or even any inspiring needlework lessons at school. So, her parents were utterly amazed when she finally opted to study for her BA Honours degree, in Fashion Design, at Winchester School of Art. On deeper investigation, it transpires that a love of fashion skipped a couple of generations in Alisons family. Her great-grandmother was a very talented seamstress who made Alisons mothers wedding dress entirely by hand. Following on from her fashion degree, Alison went to work for Maureen Rose Couture where she was employed as a key member of what was then the Queens personally appointed dressmakers, who were responsible for creating couture day and evening wear. When she finally graduated to become an in house dressmaker for the Queens royal household, Alison was responsible for the production of a range of Her Majestys outfits. This awe-inspiring responsibility involved meticulous attention to detail, working on every aspect of the Queens wardrobe, from design conception to the finished garment. And all of her work had to be executed within a strict budget. Her extensive work ranged from sourcing fabrics and trimmings, to cutting out and first stage fittings, right through to the final intimate adjustments to each carefully constructed outfit. It was while working within the Palace that Alison gained her extensive knowledge of couture dressmaking and honed her skills in embroidery, appliqu work and hand finishing. Its these kinds of painstaking skills that seem to be so rapidly disappearing from the modern world of dressmaking. During her illustrious career based at Buckingham Palace, Alison led a dedicated team of three costumiers who she trained in the art of couture dressmaking. Many of her creations were worn for very special royal engagements including a raft of high-profile public appearances around the globe. Her majesty has a genuine love of good design and fashion, Alison adds, and she was always very self-assured and positive about exactly what she wanted to wear for a particular function. Even after ten years of working for the Queen, Alison still remembers vividly her very first encounter with Her Majesty. I was utterly tongue-tied and fell completely and totally silent! she says. Alison admits she loved her job at the Palace, but began to feel the need and desire to work for more than just one client. My work for the Queen was exclusive and because of this we were not allowed to take on any other commissions. However, ultimately, it was Alisons own love of Dorset, and Bournemouth in particular, that encouraged her boldly to give up her royal appointment and branch out to launch her own business. There were times, especially when we were working to a tight schedule, that Id have to stay over in the Palace, she says, which might sound kind of cool. But I was always dying to be back in Bournemouth by the weekend. The wedding dress market is obviously one area that instantly lends itself to Alisons high-level design and dressmaking perfection. Alison has already been able to road-test her new bridal service, when she provided all the outfits for her own wedding last September. Making a dress for her own mother was a challenge she relished. The careful process a dress like this goes through ensures that when you get it right, you create a garment of the finest quality, which fits like a glove. My mum is now completely hooked! As Alison already appears to have her dream job, I asked, in passing, who would be her dream customer? With unflinching enthusiasm, Alison immediately said, Oh, Michele Obama! Her stature, poise and a telegenic smile make her a dressmakers dream. Id really enjoy helping her develop her style, she adds. Finally, with a twinkle in her eye, and without claiming to have any insider knowledge whatsoever, Alison suggests that the other great commission shed enjoy to have would be to design a wedding dress for a proper royal wedding. Can you imagine! she says with real passion. That really is the sort of challenge I could get quite positively excited about!